11. Painting something? Use Skin-So-Soft to remove paint from the hands. (Instead of turpentine). 15. Put 1-2 caps full in liquid soap and use it for shaving legs and under arms. 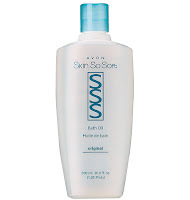 Helps razor glide and leaves skin feeling smooth. 19. SSS Original Bath Oil works GREAT on Head Lice. Saturate head and let it set for 15 minutes. Then rinse under an outdoor faucet. Shampoo hair a couple of times to get the oil out, but the lice should be gone and stay gone! Thanks for taking part in our To the Top Tuesday Blog Hop! I'm your newest follower! Hi I am your newest follower from Follow Me Back Tuesday!